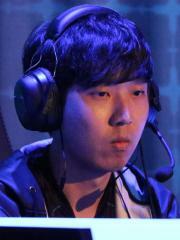 Bang "TRUE" Tae Su is a Korean StarCraft II player. At this time, TRUE is ranked #550 in highest overall earnings, and #103 in highest earnings for players from Korea, Republic of. Out of the 201 tournaments awarding cash prizes that TRUE had competed in, the largest amount was $35,000.00 from WCS 2016: Summer Circuit Championship on August 14, 2016. His 1st place finish makes up 19.22% of his total prize money won. On October 23, 2016, TRUE arrived at the $100,000 milestone, winning $8,536.02 and placing 1st at Kung Fu Cup 2016 - Season 2. Prize money from 124 tournaments got him to that point. In the last 90 days, TRUE has been awarded $2,813.90 in prize money from 2 tournaments, $2,688.90 (or 95.56%) of which came in the last month.